It’s really hard to qualify for Peach Jam. It’s even harder if you start with a 1-5 record. MeanStreets did just that, qualifying for July’s premier event after completing one of the most impressive turnarounds in EYBL history. Head coach Tyrone Slaughter and company rattled off a major run, winning seven of eight games stretched over three sessions. How did they turn it around? Look no further than Brandon Newman and Tray Jackson. The MeanStreets’ juniors led the 8th-best scoring offense at Peach Jam, playing massive minutes while leading a relatively thin rotation. MeanStreets was a top-five shooting team from the perimeter (36.5%) during the regular season, and if they catch fire, they have been proven difficult to beat. The aforementioned Newman and Jackson share the star duties, with the former operating as the leading scorer. Newman was electric in 16 regular season games, averaging 18.3 points while hitting 53 three-pointers - second most in the EYBL. Newman hit his triples at a 40 percent clip, coupling his impressive sharp-shooting with a 90% conversion rate at the line. Simply put, Newman (247 No. 89) is one of the most underrated guards on the national level, and his presence on the court is vital for MeanStreets. The 6-foot-8 Jackson stars in the frontcourt for MeanStreets, complementing Newman’s scoring ability with an aggressive, physical style of play. Jackson (13.6 PPG) averages a team-high 5.4 rebounds per game, and the high-flying recently-reclassified junior is a terrific on-ball defender. Jackson’s regular season performance paid off with several high-major offers, and he’s unlikely to leave the court much at all in July. Newman is absolutely electric in the backcourt, and he’s joined by three division one recruits. Armaan Franklin is a solid second option amongst the guards, averaging 9.9 points, 4.4 points and 1.9 assists in 16 games. A 6-foot-4 junior hailing from Cathedral high school in Indianapolis, Franklin struggled to find consistency during the regular season, but is a plus defender and is capable of scoring in bunches. Junior Marquise Walker provided a major spark for MeanStreets after transitioning from the Mac Irvin Fire after session one. Walker offers a playmaking scoring guard to Slaughter and company, putting up averages of 8.1 points and 2.5 assists while shooting 48% from distance. Point guard Joseph Yesufu rounds out the rotation for MeanStreets, providing a reliable, sturdy guard. Yesufu averaged 6.1 points, 2.7 rebounds and 2.3 assists in a reserve role, and will undoubtedly see minutes in July. Junior star Romeo Weems left MeanStreets after session two, making Jackson’s rise even more crucial to their success. Weems provided a lot while on the squad, but the emergence of Dannie Smith and return of Chris Payton helped shore up the departed production. Both juniors, Smith and Payton offer big, physical bodies capable of beating you in different facets of the game. The 6-foot-6 Smith joined MeanStreets halfway through the season, and put up a team-high 3.5 assists in eight games. Throw in per-game averages of 9.4 points and 4.5 rebounds, and you’re reading about a massively underrated prospect who should turn heads in July. Payton, a 6-foot-7 bruiser from down-state Bloomington high school, is going to play big minutes for MeanStreets in July. Payton missed the middle eight games of the season, but returned in a big way, closing out the season with back-to-back double-digit scoring performances. Junior Keeshawn Chambers rounds out a rotation that will play small the majority of the time. Chicago’s Peach Jam qualifier hold four wins over fellow Peach Jammers, proving their worthiness as a contender in Pool B. MeanStreets holds a regular-season win over fellow-Pool B qualifier Team WhyNot, and they match up very well against the rest of the pool. 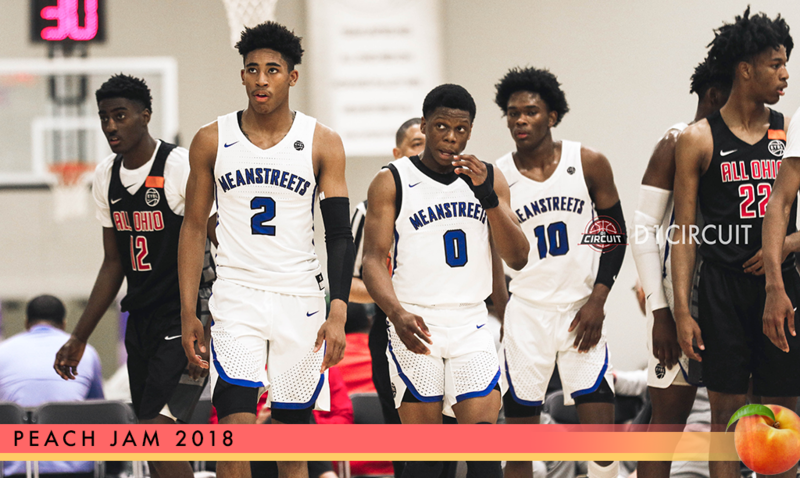 Undersized and undermanned as a unit compared to most Peach Jam squads, the defensively-challenged MeanStreets will likely need the score to be in the 80s if the expect to contend. They aren’t a favorite to advance out of pool play, but provided Newman and Jackson are healthy, the MeanStreets of Chicago should be considered very dangerous. They will be playing with the house’s money, and they have more than enough talent to advance to bracket play.